Patricia Clarkson, Caroline Dhavernas, Colm Feore, Bernard Hepton, Louise Marleau, Benoit Brière. In 1888, a wealthy American woman marries an English baron and they settle down in Paris. Their apartments not only contain impressionist paintings, photographs, a gramophone and other recent inventions, they are lit by electricity. 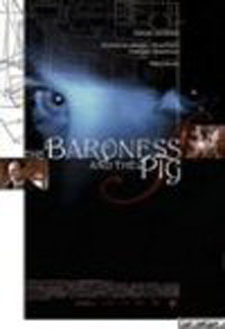 The baroness takes in a girl who grew up in the wilds with pigs. Naming her Emily, the aristocrat keeps busy by educating her, in order to make her the star attraction of her future show. But her plans come into conflict with those of her husband, who wants to sell Italian fabrics to an influential duchess who misinterprets the baroness’s ideas. When the baroness finds out that her husband wants to leave her, and that he has raped Emily, she and Emily band together to make sure he fails. Written and directed by Michael MacKenzie. Production designer: Ben Van Os. Director of Photography: Éric Cayla. Visual Effects Art Director: Meinert Hansen. Visual effects supervisor: Ron martin. Re-recordings mixer: Hand Pter Strobl. Production company: Media Principia Inc.